In this article i’d like to share a windbg script that will let us to load a shellcode from a file to kernel memory and create a kernel thread to execute it. I have not played a lot with the script yet, if you find some bug please tell me. The first argument is the path to the file containing the shellcode. The second one is the size of the memory to reserve (enought for allocating the shellcode). 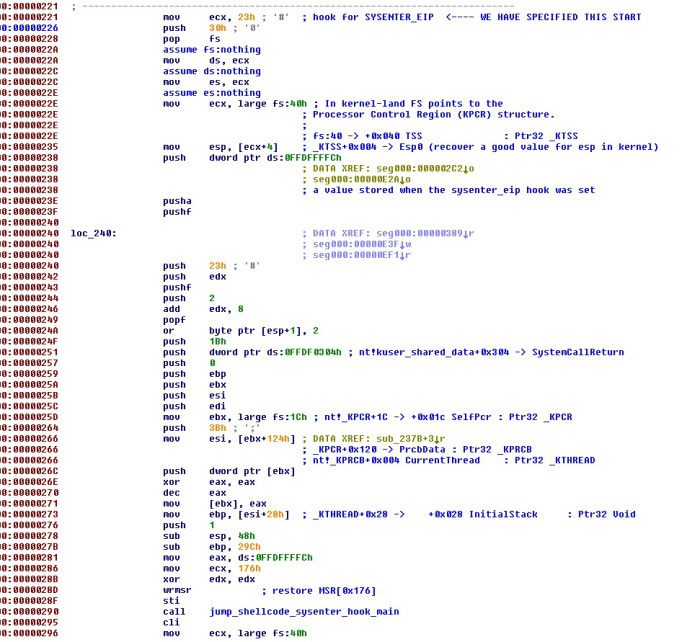 The third parameter is the offset into the shellcode where we want the thread starts to execute. Careful: The size of the file with the shellcode should be padded to fit a multiple of page size. We are using the command .readmem to load the shellcode, and it will read blocks of 0x1000 bytes. For example, if your shellcode file has 0x2800 bytes, .readmem will load 0x2000 bytes only. You will need to complete the file with 0x800 additional trash bytes to load the full code. We will need to hijack a running thread for a while. We want to redirect that thread execution to ExAllocatePool to reserve memory for the shellcode (we will manipulate the stack of the hijacked thread to do that, and we will restore it later). $$careful: .readmem will read blocks of 0x1000 bytes. For example, if your file to load has 0x2800 bytes, .readmem will load 0x2000 bytes only. 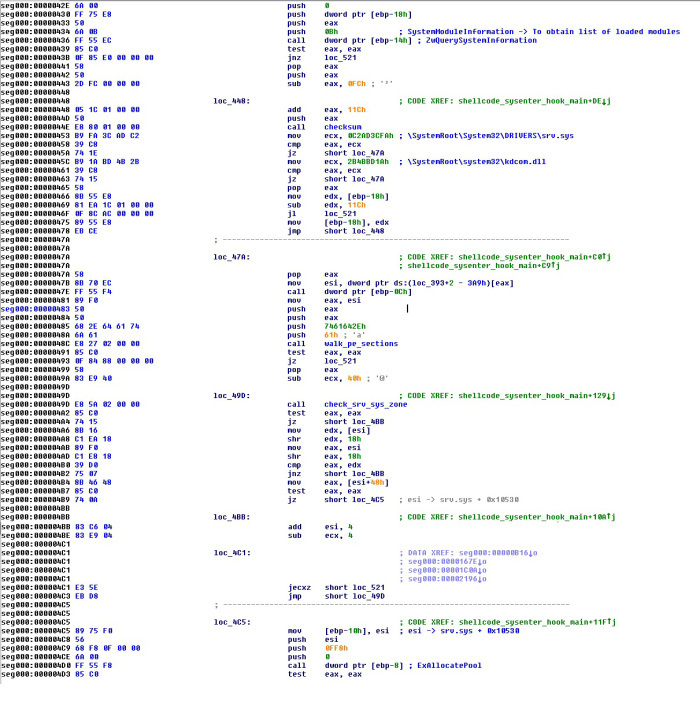 After this, windbg should stop at the breakpoint in the offset of the shellcode that we wanted the thread to start. We are going to test the script with a DoublePulsar Shellcode extracted from a worm/ransom whose name i don’t want to remember. You can download the shellcode file from here (rar password: infected). The size of the file is 0x3000. I have not reversed the shellcode in depth, but a good point for starting to debug seems to be the offset 0x221 (later we will see why). At offset 0x20B we can see a function of the shellcode that is hooking sysenter_eip. Nt!_kuser_shared_data structure is located at ffdf0000, so i guess the shellcode is using the free space in the page of Nt!_kuser_shared_data after this structure to store the temporal value that it needs. 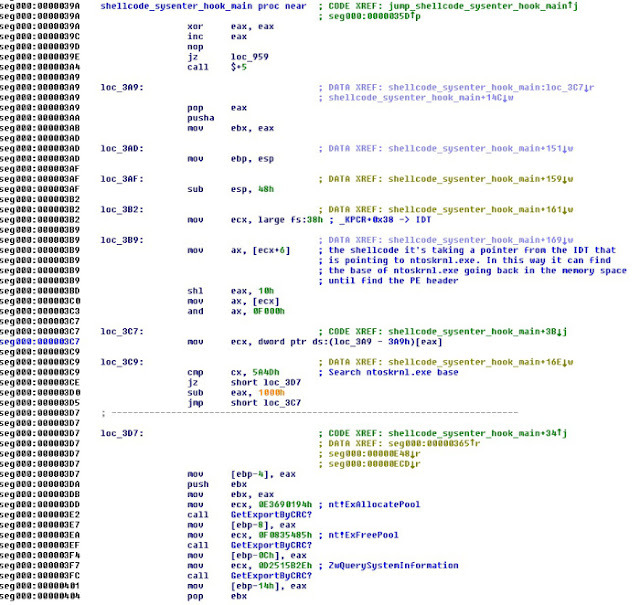 So the offset 0x221 is the hook for sysenter_eip, for this reason i think it is a good point to debug from here. In kernel-land, at fs: we have the _KPCR structure. 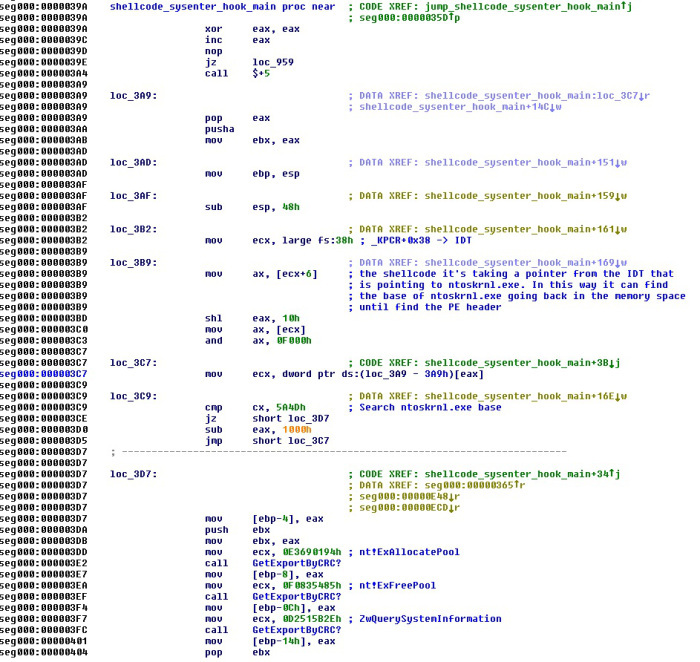 We can see how the shellcode gets some values that it needs from this structure and other structures pointed from here. After all these initializations, it calls the main code of the hook, but before, it restores the MSR (SYSENTER_EIP). It already has a thread from user mode, and probably it is enought for its purposes. We can see how the shellcode is taking a pointer of the IDT to have a address into ntoskrnl.exe. In this way it can find the base of ntoskrnl.exe going back in the memory space until finding the PE header. After that, it gets by CRC some APIs that it needs: ExAllocatePool, ExFreePool, ZwQuerySystemInformation. When it finds srv.sys, it walks the PE sections of the module, trying to find something into the data. This shellcode works with an SMB exploit. 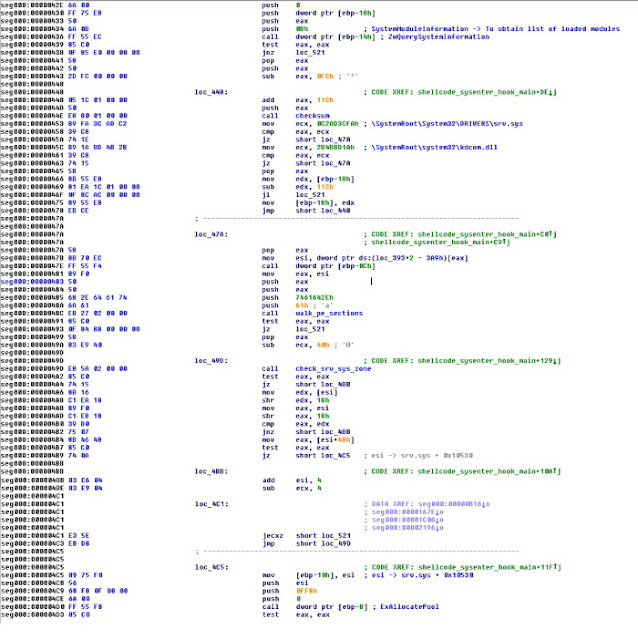 From my point of view now it is trying to find other parts of the data that the exploit sent (probably a PE to load).